Father’s Day is a time to reflect on fatherhood. It’s a day to express our love and respect for Dad and all that he represents. It’s a chance to tell our Dad how priceless is his contribution to our lives. A lot of parents have expressed their respect for their father through the contest – MY FATHER, MY HERO. They have shared stories of how father is their superhero, their role models, their strength and their inspiration. All entries were touching and inspiring and genuinely expressed love and respect for their father. They made it clear that the role their father played in each one of their lives was phenomenal. Now it is time to declare the winners. We got some interesting entries and all of them were full of love. Congratulations to all. 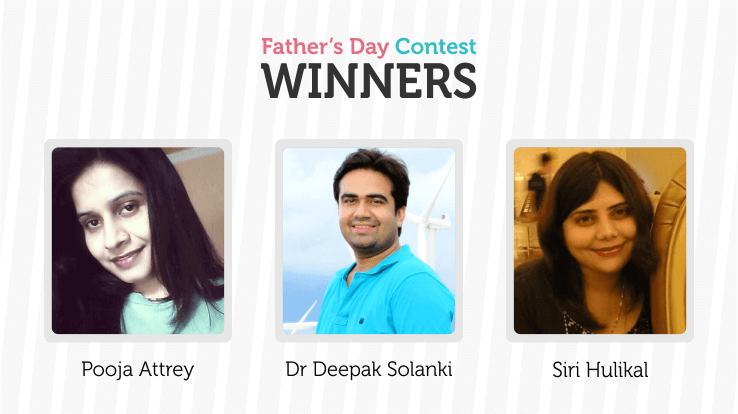 The winners of the Father’s Day contests are – Dr Deepak Solanki, Siri Hulika, Pooja Atrey. Their winning entries are mentioned below. Dr Deepak Solanki - Oscar wilde once said "memory is the diary that we all carry about with us". Memories are like pages of life filled with our own colours. I and my father used to share a very close bonding ever since I remember. Since my childhood days, he used to drop and pick me up from school. We used to talk on a host of topics on the way home ,be it the homework ,upcoming tests /exams, vacation planning ,the ongoing cricket series ,my demand for a bicycle /video game/I pod etc over the years .He was very honest, hard working and self confident man. During childhood ,whenever I used to pick up fights with my cousins ,I used to have the last word and then run to him because I knew he'd save me, no matter what .We regularly used to go to nearby sports complex where we used to play like best buddies over the years . Discipline and self control were the values he taught me, and it was his habit of perseverance that led me to excel in my studies and co-curricular activities together. I remember when I had my first school debate and stage fright was killing me , he told me to be fearless and to imagine the crowd as your juniors/subordinates who have come to listen because they were unworthy of this stage ,this mic, this opportunity .Go ahead and show them who you are. Believe me, that speech was my best ever .I got a thunderous applause in the end but I knew in reality it was for my dad who made me do it. We had lot of son-father quarrels too. In the end often he used to give in to my request and often the patch up ended up with a surprise treat. Be it helping a family member/friend, be it donating things to the needy, be it keeping a calm and composed posture when times were tough, my father always had a 'never say never' attitude and I respected him for it. I remember when I got selected in my medical entrance tests ,those tears of happiness I saw in his eyes , that confident smile as if his heartfelt wish had come true ,those priceless moments got engraved in my heart forever ,ones I can never forget .Times passed by ,and so did we grow. We laughed together, we shared together, we missed each other while I was away for studies. But when it was his age to reap all the goodies, unfortunately dad got diagnosed with cancer. Doctors told me about the advanced stage of tumour, about poor prognosis but I didn't give up .After all dad was my pillar of strength and how could I let it fall without giving my best shot .The best doctors, the best institutes, the best investigations , the best treatment that money could buy, one that's available right now in this world , I provided everything for my dad. After a hard fought battle with cancer, god decided to end his agony and took him to heaven. It's sad to lose a part of yourself and still keep on living this life. But for all that he was all that he taught me, I will forever be indebted to him for being the best dad in this world, my hero, my inspiration. I'm proud to be his son. He might not be physically here with me but deep in my heart, in my soul, he stays with me ..... those lovely memories ,those jokes, that laughter ,those picture frames paused in endless happiness.... My father was my hero and will forever be. Siri Hulikal - Early memories of my father are rather different than the usual types. I don't remember him as a doting one. My mum once told me that, when we were babies (me and my sis) he would just give a kiss, lift us once or twice and go about his work. I don't remember being hugged by my dad. He was quite strict with us. He had a perfect way of arranging things. There was nothing haphazard about him. We were supposed to keep things the way they should be. Everything perfectly arranged. My father has three obsessions one books, other music and the third coffee. I am an avid reader (like my father) if you ask me when I started reading I have no answer. I don’t know I had just fallen in love with my father's book shelf. He would bring books as gift from where ever he went. Everyday of our childhood, we would wake up to the voices of amazing classical singers and a strong aroma of fresh ground coffee. My sister inherited his love of music. And coffee, well yeah we both love a good cuppa. Though I loved him for the love of his books, for his values and morale which are imbibed in us because of him, I could say I was never close to him or talked to him much. Nevertheless as I got older I learnt he isn’t much of a talker, he doesn’t know how to converse with children. His own children! But we had a great deal of conversation, debates, everything as I grew up. I learnt how good he was at his work and how he held on to his values even at the most difficult times. I left what I was studying in the middle. He was so supportive. It burnt a huge hole in his purse. He didn't care. All he cared was my happiness. Made me join my preferred field! When I did well he was very happy, a proud father. Now he has become a doting super caring grandpa to two little boys, who make him smile with their little tricks. He will be sixty this December and will lead a retired life from coming Jan. My father doesn't look like those hero dads whom we see in T. V and magazines. He is hardly in peak of his health, he gets tired easily, and his stomach gives him a hard time. However, he is a wonderful human being. A hero who taught us to be kind, loving, helpful and at the same time bold and to be true to ourselves! Appa I understand now, how doting you are and you were, you cared for such small things, took us to so many places, got us many things, taught us heaps, created a wonderful childhood for us. YOU ARE MY HERO. LOVE YOU APPA. HAPPY FATHER'S DAY. Tall, handsome, dashing personality, influencing aura... where even his mere presence spoke louder than many people... that's what I remember when I think of my father! He was in police and that justifies many of his characteristics. The rough n tough man that we knew as our father was not PERFECT n FIGURED IT ALL type father though! We lost our mother very early... n that was something he couldn't recover from. His occasional alcoholism (lot courtesy to his profession) became a chronic one... eventually costing him his life. But what he has done for his life... for my mother's n for us.. Me n my brother... is what makes him our HERO. A self made man himself, he did what all could be done to save my ailing mother.. but couldn't! Despite being a part of very orthodox n conservative family, he sent my brother to best boarding schools for his studies n got me admitted to a private school. Whereas my cousin sisters all got married around 18 years of their age n bore two children by 20, I completed my studies with distinction, merits n prizes. Not just this, he made sure I learnt to drive by I entered 12 class. We lost him when we were about to give our 12 board exams. That year we barely survived but after he went, my brother took his place for me. He fathered me later... quit his studies.. made me complete my bachelor's than masters. Now we both are married n have kids, but I know at heart, he still is a second father to me. So I guess I have two heroes... My dad... with all his weaknesses, his broken soul... certainly not PERFECT but my very own super hero And then my Brother... who after so much struggle in life, now owns a restaurant business and a loving family.... my second super hero! I love them both to soul! Happy Mothers Day to all Moms!! Hi.. Iam six weeks pregnant but am bleeding like a..
How does fungal infection occurs... hw can i preve..
My child is very lazy. 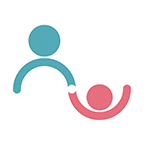 she never does any work whi..
Hi dr, moms pls help my baby is 1 yr old and hecia..